I am so excited to share this review with you today finally! 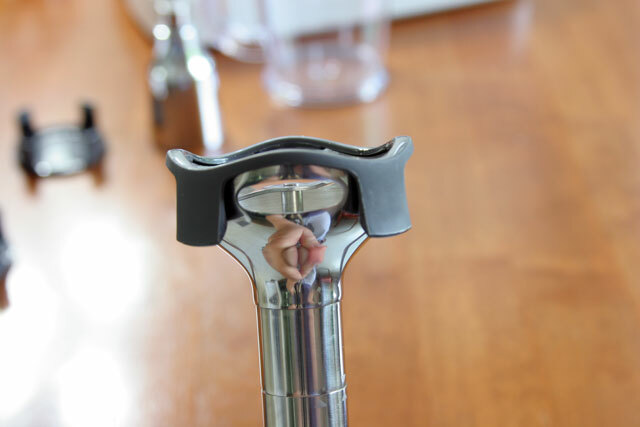 I received this KitchenAid 5 Speed Hand Blender for review. 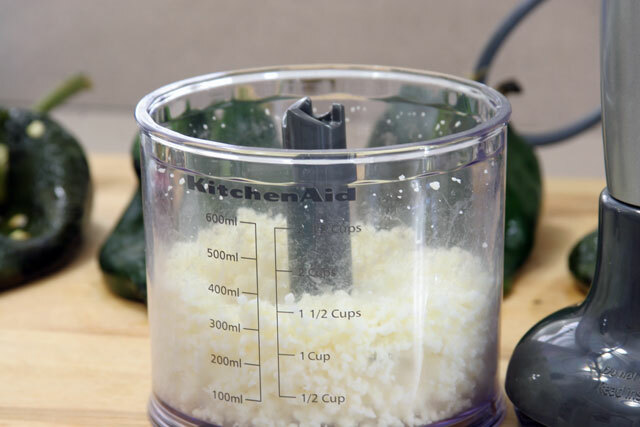 I put it to work on one of my favorite Mexican meals which involves many steps, and this was the perfect tool for the job. 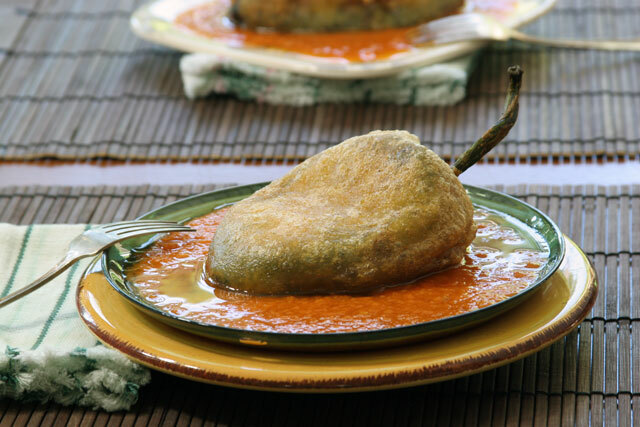 I made Chile Rellenos from start to finish. When I got the package I could not be more pleased. The Blender comes in this nifty package where it is all contained, safe, and ready to go. It is also dishwasher safe, which is a must for someone who is cooking all day, every day, like me! I examined the blender carefully, and I am happy to report, it is well made and very sturdy. For $129.99 you get a good solid product that could last a very long time. 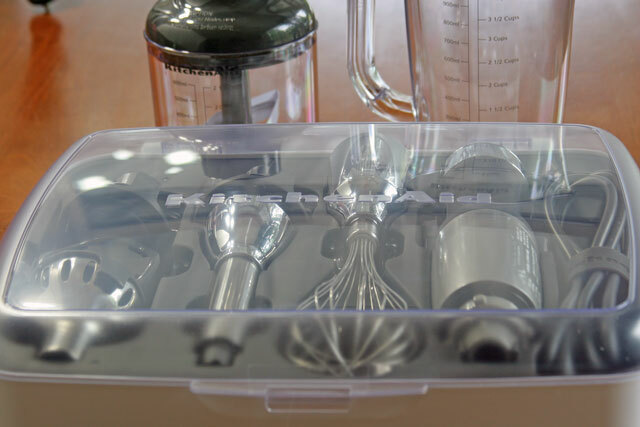 The case includes the 8 inch blending arm, three bell attachments that perform various tasks, a whisk attachment, a one liter cup, and a two and a half size cup to use for mixing, both BPA free. S Blade: It blends, crushes, and purees. Use it for soups, smoothies, crushed ice, slushies, sauces, baby food. Multi-Purpose Blade: Chop meats such as crab for crab cakes, minced meat dishes, gravies. Frother/Beater: Lattes, frothy milk, batters, cappuccino. Whisk: Whip egg whites, whipped cream, mouse, hollandaise sauce. Chopper and Blending Pitcher: Shredded cheese, vinaigrette, chop nuts, salsas, bread crumbs. 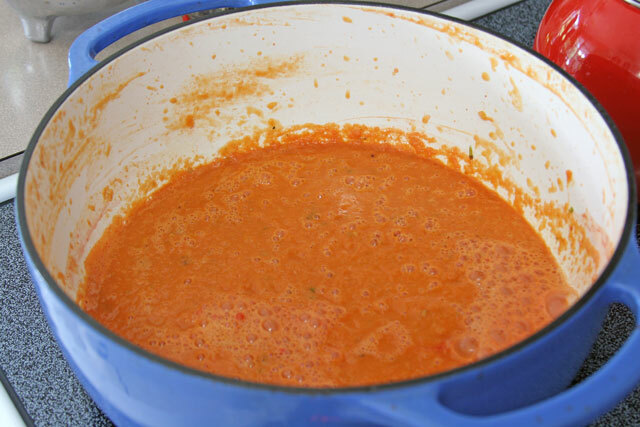 I made the tomato sauce for the Chile Relleno in a deep dutch oven. I used the bell blade attachment on large chop tomatoes that I had roasted. I did the rough large chop on purpose to put the hand tool to work. It did wonders. The large pieces were pulverized in seconds. I also tested it by putting large whole garlic cloves in the pot. The bell whipped right through the garlic, leaving no trace behind except the flavor. 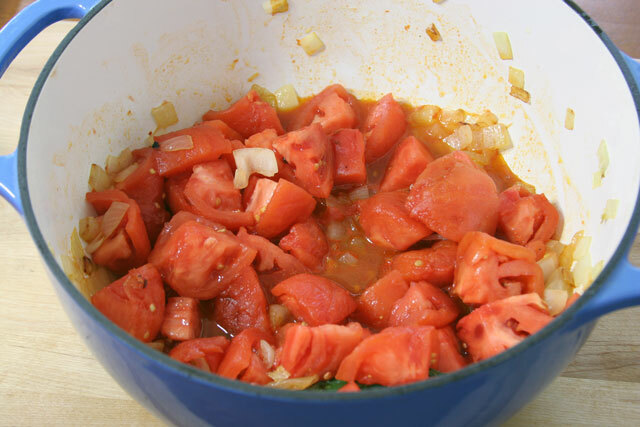 The sauce was smooth and ready to be cooked in just under two minutes. I was extra happy to see a pot protector for the blade attachment for non stick pans or dutch ovens. The last hand blender I had scratched up the bottom of my pot which made me sad. 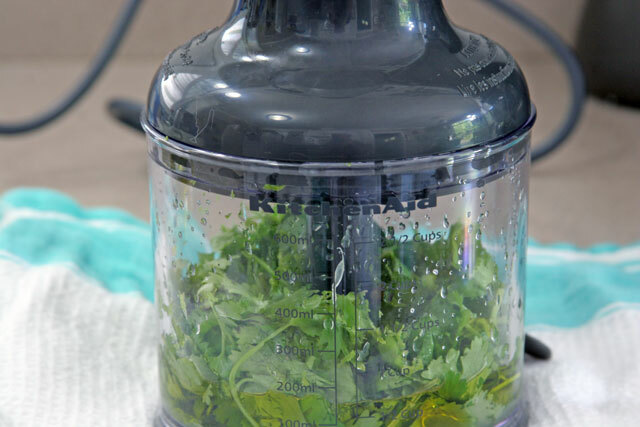 To see the thoughtfulness of this protector made me like this blender that much more. No more scratches! I whipped egg whites to a stiff peaks for the Chiles using the one liter cup and whisk attachment right in the cup. It was extremely convenient, very effective, and useful. Instead of using my stand mixer, I grabbed the cup, the hand blender, whisk and whipped away. It was easier to put the attachments in the dishwasher rather than washing my stand mixer bowl by hand. I like that part very much. I achieved the right consistency and peaks from the whisk, which is important. I also wanted to test out the smaller cup which has its own blender attachment for it right inside of the cup. I chose to blend the cheese I needed to fill the Chiles. I wanted to test its strength, so I chopped the cheese in large chunks instead of small. I was very impressed by how easy that tiny cup blender chopped up the cheese. I had all the cheese I needed, and measured out for me in under one minute. Again, very convenient, which is what we are looking for in the kitchen right? Instead of pulling out my food processor for the small amount of cheese I needed, I used the hand blender, with little clean up. I then realized I wanted to see how it would do making a vinaigrette. 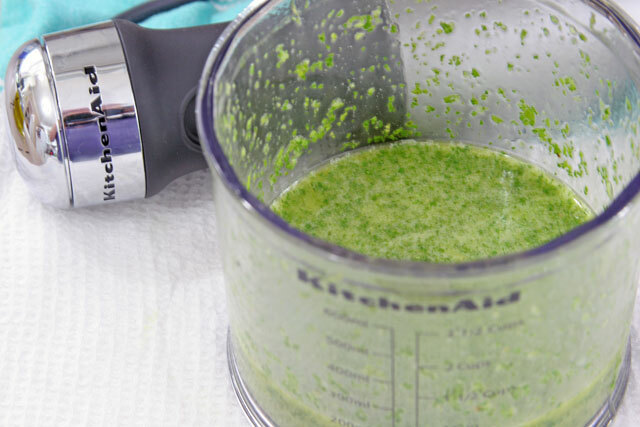 I typically make dressings by hand, but I needed a cilantro dressing for a salad I was making. I would normally take the time to finely mince the cilantro. I threw the cilantro, oil, and lime into the smaller cup, blended up a vinaigrette in no time at all. Leaving the cilantro in the small pieces that I wanted for the dressing. All in all it was a fun, and very productive day. I made a variety of things I needed for one dish with one very handy and easy to use tool. The hand held part itself is easy to grip, and the large button to pulse is well made and very responsive. The attachments slide and lock as one would expect. But equally easy to remove and inter change with another bell attachment if needed. I found it very easy to use all day, with enough power to do what I needed done. The final dish came out lovely! The recipe for that will be available here. Disclaimer: I was given this hand blender by KitchenAid in exchange for a review. I was not otherwise compensated. All opinions of this product and this post are my own. Doesn’t this take a lot of time since it is a hand blender? I’m more excited though, to try the different blades considering the 5-speed feature. I would love one of these to my life a little easier in the Kitchen! Amazing… I’ve always wanted one of those! 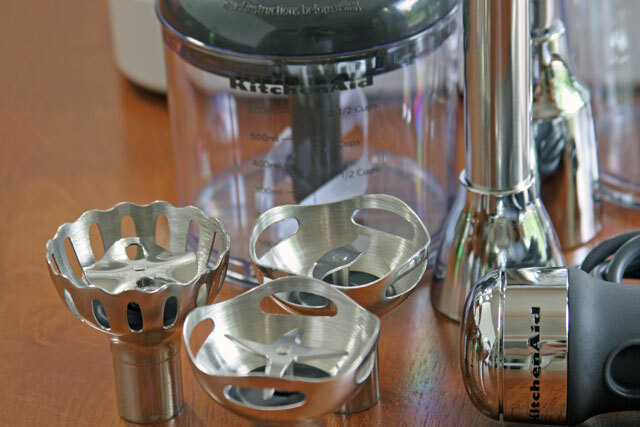 Now I know which brand to put on my wish list… although, with Kitchenaid, you know it is great. Great review! It is totally worth it, and thanks!